Man, I thought I already set up this post… I guess it’s not late yet… Technically I shouldn’t post till midnight anyway. I’ve just gotten used to doing it so early. Anyway, chemistry humor, huh? SCIENCE! I’m sorry hydrogen and oxygen in vast amounts is always fun when you mix in a spark, or a nuclear warhead…. Not to deliberately one-up Rodrigo… but Caesium and Sulphuric Acid. Heck… why not Fluoroantimonate? Sodium and water’s pathetic hissing and skimming around just isn’t going to cut it. I have long wondered what Francium would do… but I doubt it would stay Francium long enough for me to find out (and I wouldn’t stay healthy long enough either). Fluoride and water! AND salt! 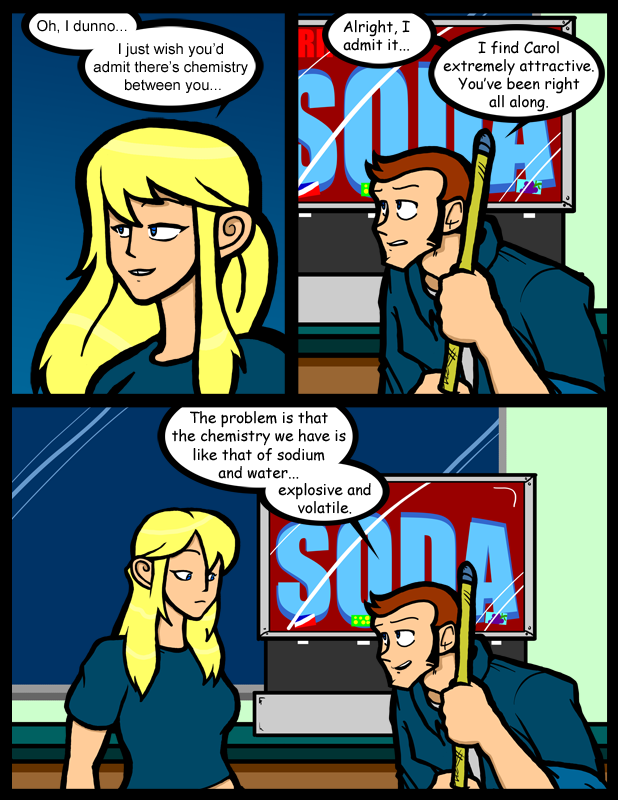 and doesnt sodium just dissolve in water, rather than explode? Still all true ths far for those keeping count and while sucessfully dodging the elephant in the matter too.